Dropbox introduced a new version of its desktop client Friday that comes loaded with an upgraded version of its file-sync technology. It now includes the ability to stream so that big files like video or audio can be retrieved by users faster. Dropbox users can now open up their large files and have the first part of it appear while the rest of it fills in, similar to how Netflix users can stream and watch videos before they are finished downloading. 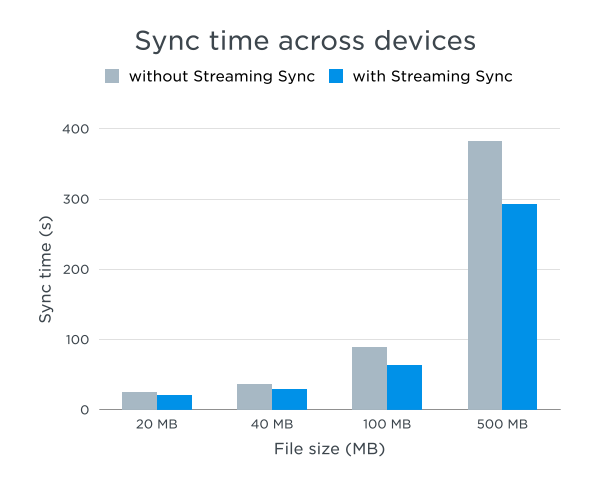 The company claimed that with streaming, sync times can potentially be twice as fast as before. With Amazon’s (S AMZN) Zocalo document collaboration tool taking the spotlight from both Dropbox and Box’s own collaboration tools, it seems as if both Dropbox and Box will have to release some new capabilities to their products in order to distinguish themselves in this competitive market. It was only last June when Dropbox competitor Box bought out the startup Streem in an effort to bolster its own streaming capabilities. Bitcasa, a cloud storage competitor to both Dropbox and Box, operates solely on streaming. Post and thumbnail images courtesy of Shutterstock user cybrain. I like DropBox but things like this make me feel that DropBox could always increase the speed of the sync rate and that they were either holding off because it may become a selling feature for their larger business accounts or a USP if the competition heats up. This is one reason why I like Amazon – they shake up the market to the benefit of end users.